De PicoLog CM3 stroom Data Logger is een compact en makkelijk te gebruiken data logger voor het meten van stroomverbruik in gebouwen en machines. The 24–bit resolution of your PicoLog CM3 ensures that you can detect the smallest changes in current, while with accuracy within ±1% you know that can rely on your measurements. With a conversion time of just 720 ms per channel your PicoLog CM3 is capable of logging fast changes in current, but we know that in order to identify problems you may also need to monitor currents over long periods, so with a PicoLog CM3 you can take measurements at a speed to suit your application — whether that’s every few seconds, minutes, hours or even every few days. With both USB and Ethernet interfaces your PicoLog CM3 can be used in a variety of situations. If you need a portable instrument that can be used at various locations and is fast to set up and use, simply connect your laptop to the PicoLog CM3 by USB. Need to monitor a situation over a period of hours or days, or from a remote location? Plug your PicoLog CM3 into a spare port on your network and then access it remotely either from your LAN or over the internet — thanks to Power over Ethernet (PoE) technology you don’t even need a separate power supply. 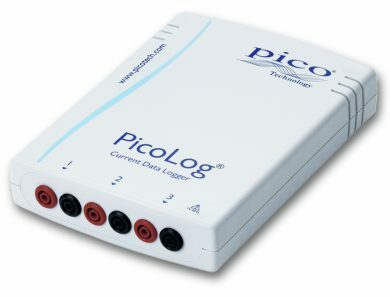 Your PicoLog CM3 Current Data Logger is supplied with PicoLog data logging software. With PicoLog you can collect up to one million measurements, analyse them and then display the results in spreadsheet and graphical formats. You can view the data both in real–time as you are collecting the measurements, or you can save the data and view it later. You can also set alarms to warn you if the current goes above or below a set value. A software development kit (SDK) is also supplied. The SDK contains a range of software drivers and example code that you can use to write your own software or to use your PicoLog CM3 with third–party software such as LabVIEW. With a PicoLog CM3 you can measure three separate currents. If that’s not enough, using PicoLog software you can add a further 19 PicoLog CM3s to your PC — enabling you to simultaneously measure up to 60 currents. Alternatively, you can mix–and–match Pico data loggers to create your own custom data acquisition system. For example, you may want to monitor how the opening and closing of doors affects the temperature and electricity usage of a cold room. You could do this with a PicoLog CM3 and a PT-104. With three channels, high accuracy and low noise, a PicoLog CM3 Current Data Logger is ideal for recording data from both single–phase and three–phase AC supplies. While its compact size, together with having both USB and Ethernet interfaces, gives you a versatile instrument that you can take with you or leave on–site for remote monitoring. Whether you need to monitor three–phase motors and generators, measure the current consumption of HVAC systems or simply monitor the current consumed around the home or office, a PicoLog CM3 Current Data Logger is the only current data logger you need.